This Wot I Think is destined to go down in RPS history. For the first time ever a review on this site will make use of VAR (Virtual Assistant Reviewer) technology. If I make a “clear and obvious error” while describing Football, Tactics & Glory’s features or extolling its myriad charms, a team of ancillary reviewers known colloquially as ‘commenters’ will notify me of my mistake almost instantly. Heed the following ruddy exhortation to discover whether this revolutionary experiment in game reviewing succeeds or fails. As accessible as Saudi Arabia’s defence and as hard to turn your back on as a cloud of Volgograd midges, Football, Tactics & Glory casts you as the world’s most hands-on foot-to-ball gaffer. 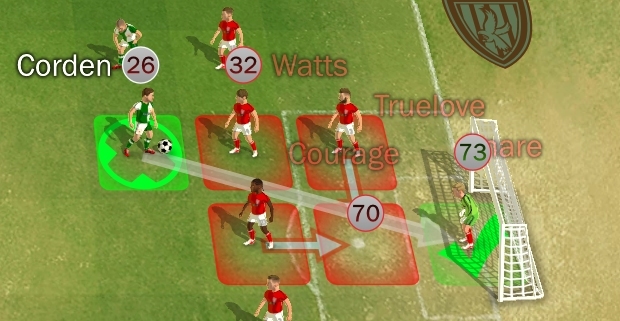 Not only do you get to decide who plays and where, you can personally engineer every one of your side’s tackles, runs, passes, and shots if you wish to. And you will wish to. 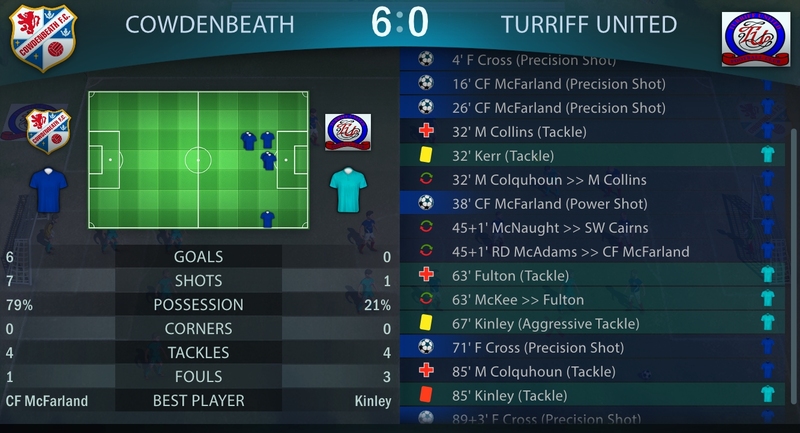 FTG’s over-in-five-minutes turn-based turf tussles are optional but astonishingly moreish. I’ve waltzed through around 200 during the past fortnight and still can’t get enough of them. I’m currently attempting to guide The Blue Brazil from obscurity to scurity, and very much doubt I’ll be able to get through this entire review without nipping off for at least one fixture. Working out how much of FTG’s monstrous magnetism is down to the tac layer’s stylised-yet-evocative mechanics, able AI and beautifully judged randomness quotient, and how much is down to the way individual results speedily build into plausible multi-season club sagas is all but impossible. All I can say for sure is that I can’t recall the last time I played a PC wargame or simulation (my usual fare) with a long game anywhere near this compelling. Every new saga begins with a choice of country, club, kit, and sponsor. 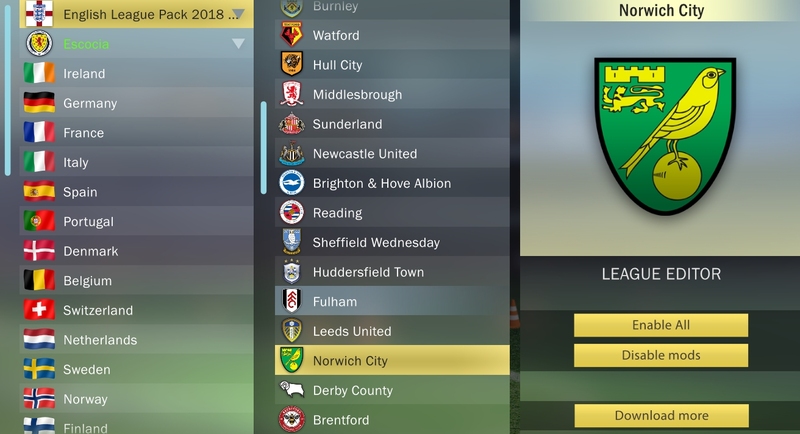 The default licence-dodging teams can be customised and modded to more closely resemble real clubs, but the league and cup structure is identical whichever country you choose and therefore probably wont represent conditions and rules in your part of the world perfectly (There seems to be no way of simulating the EFL’s play-off system, for example). Matches are IGOUGO, played on pitches ten squares long by seven squares wide, and last for 45 ‘actions’*. Each turn you get to use three actions however you see fit. One turn you might use your trio to press and dispossess some maddeningly skillful winger. In another you might spend them on a pair of beautifully weighted passes followed by an inch-perfect cross or fierce long-range shot. Players aren’t complete automatons. Once sufficiently experienced to join one of twenty classes (sweeper, central defender, universal forward etc. ) they’ll perform certain actions automatically and for free. During an opponent’s turn your defenders may dart into neighbouring squares to tackle or intercept. 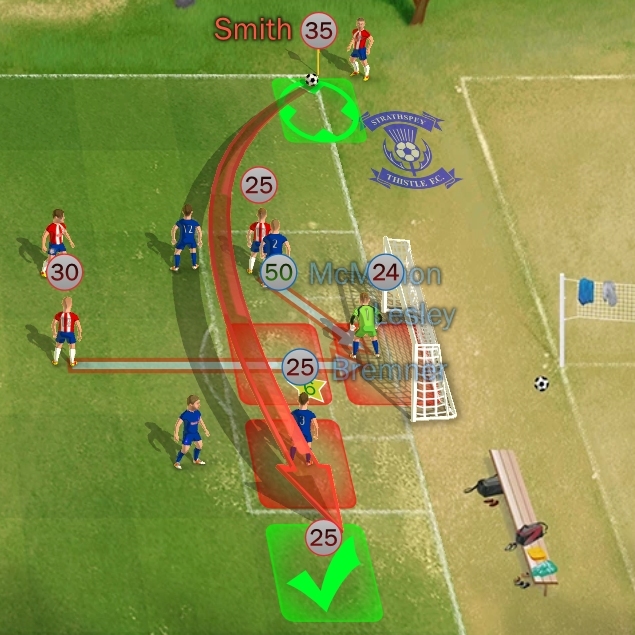 In your own turn, strikers may push goalward or jump in response to crosses. Four core player stats (accuracy, passing, defence and control) modified by things like weather, fatigue and pressure, determine the likelihood of a move succeeding. Short-range uncontested passes never go astray but tackles, shots and ambitious long-distance passes always contain an element of luck. Try to thread a low cross through a Nottingham Forest of legs and your player’s passing roll will need to be higher than the defensive rolls of everyone the ball passes. Perhaps in the circumstances a shot would be wiser? Because the game uses an elegant mousewheel system for switching between order types and helpfully displays all the relevant modified base stats for any action, comparing tactical options is usually easy. Skills are the velvet-waistcoated foxes in the FTG hen coop. Acquired slowly as players gain experience and level up, party tricks like ‘nutmeg’, ‘rainbow feint’ and ‘lay-off pass’ represent those flashes of brilliance that stir crowds, sunder defences, or prevent seemingly certain goals. Like standard moves they don’t always work; unlike standard moves, when they do succeed they have no action cost – a powerful inducement. Almost every turn you find yourself choosing between safe, slow build-up play, and more swashbuckling moves capable of generating quick scoring opportunities. 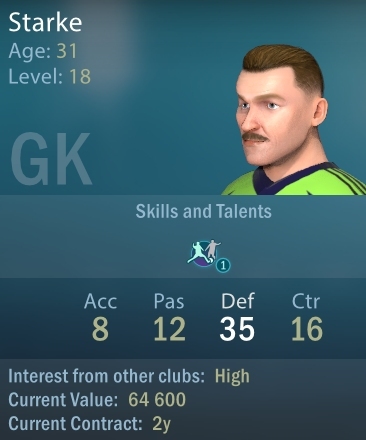 On the rare occasions a sequence of dazzling turn-extending skill moves ends in a goal, the pleasure pay-off is massive. Although goals are FTG’s most concentrated and common delight bringers, the game is littered with numerous other sources of satisfaction. Great saves. Timely tackles. Inspired substitutions. Nurturing youngsters – watching them turn into beloved fan favourites. Raising spirits during a mediocre season with a fairy-tale cup run. Even 0-0 draws can be gratifying when the opponent is formidable or you’re battling with injuries or fielding an exceptionally weary side. At the start it’s tempting to use your best players in every match. With experience comes a more thoughtful, bespoke approach. I’ve learnt to rest older stars before crucial matches and replace them with energetic teenagers when goal cushions are plump. 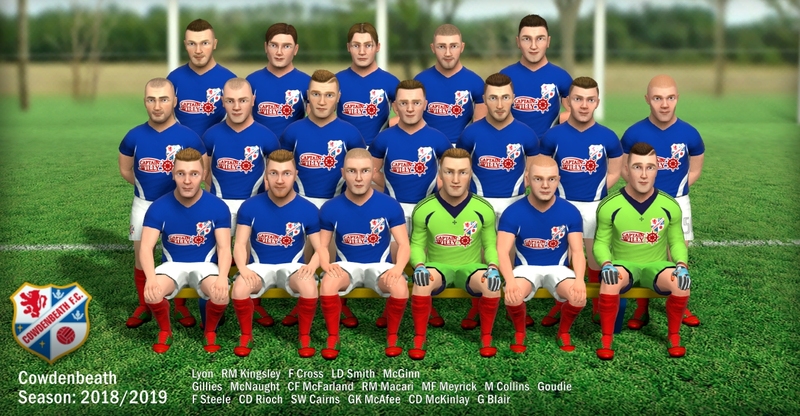 In my current career I’ve just had to say goodbye to two long-in-the-tooth linchpins whose contract extension fees (which take the form of either cash or ‘prestige’ – an in-game success reward) were beyond Cowdenbeath’s modest means. The men that replaced the local legends were inferior in almost every respect, but, thanks to careful blooding and development choices, weren’t completely out of their depth when the call came. Experience has also taught me the importance of on-the-fly formation tweaking. One of the AI’s few noticeable weaknesses is a reluctance to alter a formation that’s proving vulnerable. When the opposition is statistically superior it can generally get away with a blinkered approach. When it’s weaker, the failure to re-jig invites carbon copy goals. The four division set-up ensures all campaigns start very gently and gradually toughen. I’ve managed to secure some silverware with my initial club, but, reassuringly, have yet to fashion a squad capable of reaching the top tier. As any supporter of a lowly side will tell you, you don’t necessarily need glamour ties and promotion bids to ensure excitement. In FTG as in life, a spot of FA Prestige Cup giant killing or an improbable eleventh hour relegation zone escape can be every bit as exhilarating as championship success. Although bolting extra elements to FTG would risk compromising its pace and approachability, I think I’d like to see a ‘reserve league’ checkbox added to the options screen. 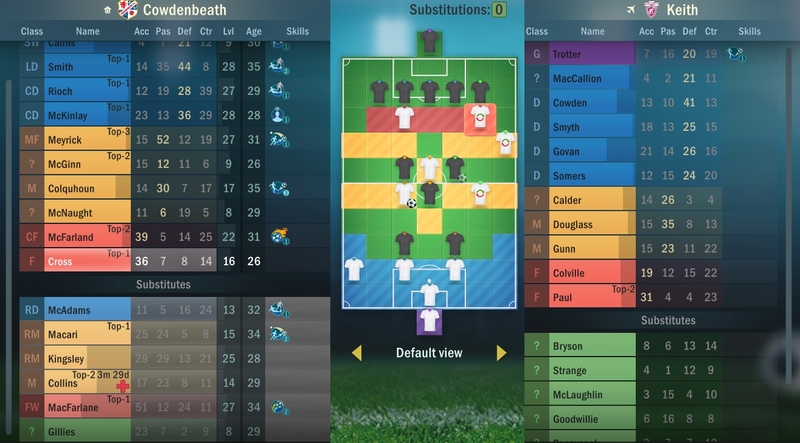 Hothousing second stringers with the help of the XP-generating ‘bench coach’ (one of ten purchasable multi-stage club upgrades) feels a tad bogus and reserve team success could counterweight first team failure rather nicely. Pepping up prosaic fixture lists and making painful partings with long-serving stars feel less perfunctory, local derbies and testimonial matches might also be worthwhile additions. Tellingly, my tactical wish list is almost empty. Penalties are pure Russian roulette at present (Choose left, right or centre for shot/save direction then cross your fingers) and I’ve yet to see a shot hit the woodwork, or ricochet in off a defender, so perhaps Creoteam could add texture in those areas. An interface aid that warns when specialists are out of position (some skills are only available when players are in specific zones) would arguably be of more immediate value. Although the embedded manual is excellent, and the rules generally clear and logical, some aspects of the game like putting players in positions where they can automatically exploit crosses, can be confusing at first. 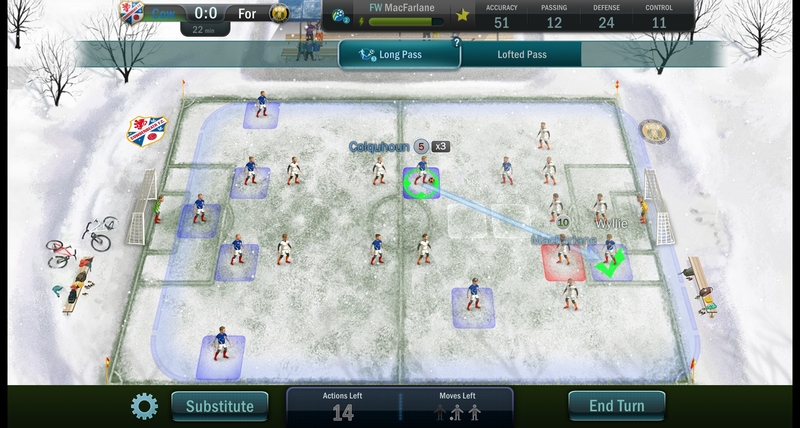 A beautifully engineered tactics title free of gimmicks and artificial grind, Football, Tactics & Glory abbreviates without over-simplifying, and absorbs without overwhelming. If, like me, you crave the drama and flavour of club football, but don’t have the patience to grapple with full-blown management simulations like Football Manager, or the manual dexterity or even-temper necessary to play games like FIFA, anticipate obsession. 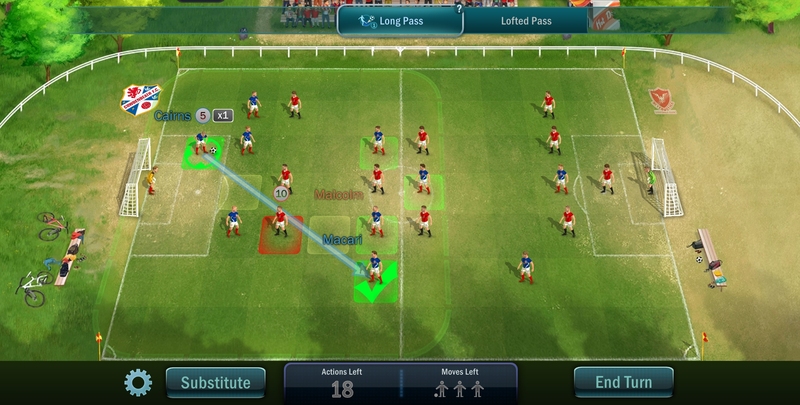 Football, Tactics & Glory is available now, priced $18 ($20 from the start of July). Tagged with Football Tactics & Glory, review, RPS Recommended, The Flare Path, wot i think.